MHI SIMGAS is a versatile integrated process gas/atmosphere management system for processes where more than one gas is required. The system provides complete stand-alone process gas management on a single platform while integrating itself in the form of interlocks with its peripheral instruments and control systems. SIMGAS: The system consists of three modules: Module 1: SIMGAS MODULE1 (PLC) Module 2: SIMGAS MODULE2 (GAS FLOW) Module 3: MODULE3- (HGI). Flammable gas flare-out system. FLOWGAS is a new low price system for a 4 gas module including flamable gas. 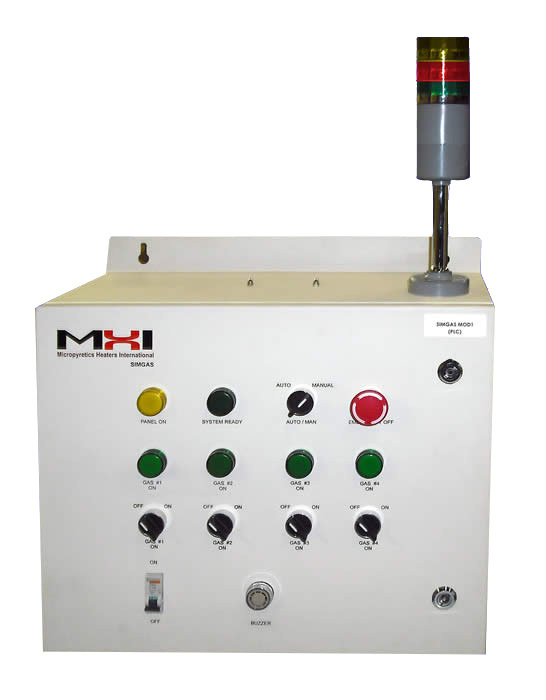 USe for premixing and flow control. 1-DataLog is a hand held data logger. 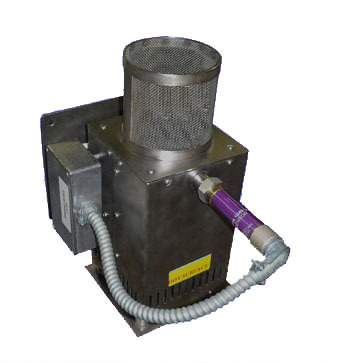 Vac-Gas is a vacuum attachment system. O2 sensors and hand held read out are quoted. Multi-level audio and visual alarms triggered by flow conditions. Easy installation. Full manual and Installation diagram provided. SIMGAS Module 1 provides clear and easy analog controls for gas mixing. Equipped with an automatic shut off with audible alarm for safety- some model offer safety lights. Module 2 - (GAS FLOW). SIMGAS Module 2 provides complete gas flow controls with 3 manual adjusting flow meters. The fourth flow meter controls compressed air for process cooling or purging. Unit layouts vary. For higher flow rates, see GPAN. SIMGAS Modules (1,2 & 3). Detailed Descriptions. Module 1: SIMGAS MODULE1 - (PLC). The SIMGAS MODULE1-(PLC) is a PLC based electrical control panel capable of controlling between 2 and 4 different process gasses (standard model is for 4 gasses). The PLC comes loaded with a program that has self diagnostics, Process initiation, Interface with external interlocks, control of gas valves in Module 2 - (GAS FLOW) and control of the flammable gas flare system in Module 3 - (HGI SYSTEM). The SIMGAS gives multi level audible and visual alarms, and incorporates safety / emergency shut-down. Module 2: SIMGAS MODULE2 - (GAS FLOW). The SIMGAS MOD2(GAS FLOW) is a gas delivery panel. The panel incorporates gas manifold, manually settable gas flow meters, ON/OFF gas solenoid valves operated thru the SIMGAS and pressure switches for monitoring of gas pressures. The HGI Flammable Gas Flare-out Module is a safety gas flare-out that burns off combustible gases from the process. The module houses an integral burner pilot flame and a UV flame detector for positive flame detection. 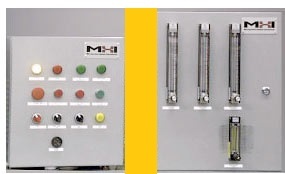 The HGI constantly monitors the flame and, in the case of a flame-out condition, the PLC control panel initiates to revive the flame. In the event that the flame is not re-ignited within this time, the system initiates a safe shutdown of the process with the required alarm level. The HGI Flammable Gas Flare-out Module is a safety gas flare-out that burns off combustible gases from the process. The module houses an integral burner pilot flame and a UV flame detector for positive flame detection. The HGI constantly monitors the flame, and in the case of a flame-out condition, the PLC control panel initiates to revive the flame. In the event that the flame is not re-ignited within this time, the system initiates a safe shutdown of the process with the required alarm level.